In addressing our core mission to help those in need in overcoming barriers to success, the Vistex Foundation has sought opportunities to support organizations providing programs that improve health and education for those most in need. We have been fortunate to be part of funding wonderful small, local organizations throughout the world who know the individuals they serve and provide them much needed services. It has also been part of the foundation’s mission to seek opportunities to support larger scale projects that can make life-changing impacts on a community-wide scale and that can be expanded and replicated over time. Building and supporting healthcare facilities in underserved areas is a critical step in the development of a community and in the improvement of people’s lives. One cannot learn, work, or raise a family if sick. 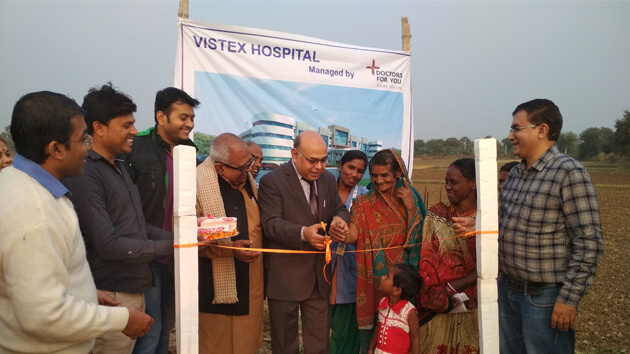 We are excited to announce the groundbreaking for the Vistex Hospital in Masharhi, Bihar, India. Through a grant to Doctors for You, the hospital will provide primary and secondary health services to a population of more than 50,000 on the outskirts of Patna. In addition, the facility will provide maternal and child healthcare, diagnosis and treatment of malnutrition, an operating theater for surgical care and trauma victims, pathological laboratory services, and will serve as a hub for community outreach and development. We chose this region of India due to its significant need. Bihar has one of the highest poverty rates in the country, suffers high maternal mortality rates, a shortage of doctors, medical specialists and facilities, the region is in desperate need of investment and support. Check back often for updates on the project, interviews with partners on the ground in Patna, including Dr. Ravikant Singh of Doctors for You, and stories about the community we are proud to be supporting.